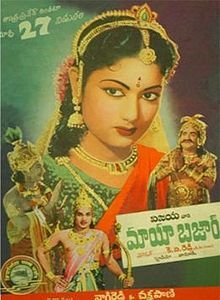 Mayabazar is drama based movie in which, During the Pandavas Agnyatavasa (period of exile), Arjuna sends his wife Subhadra and their son Abhimanyu to Dwaraka to stay with her brothers, Krishna (N.T.Rama Rao)and Balarama (Gummadi Venkateswara Rao). Sasirekha (Savitri), Balarama's daughter and Abhimanyu have been in love with each other from their childhood. Their families had agreed to get them married when they were children. However, Balarama's wife refuses to honour that commitment as the Pandavas no longer have their kingdoms and are in exile. Balarama decides to conduct Sasirekha's marriage with Lakshmana Kumara (Relangi Venkata Ramaiah) who is his favourite disciple, Duryodhana's (Mukkamala) son. Krishna advises Subhadra to approach (Ghatotkacha) (S.V.Ranga Rao). Initially Ghatotkacha assumes them to be intruders in his forest and attacks them, but later apologizes once he realizes who they are. He goes to Dwaraka along with his retinue. Using his magical powers he assumes the form of Sasirekha and goes about wrecking her marriage with Lakshmana Kumara. Maya Bazar (1957) Mayabazar is drama based movie in which, During the Pandavas Agnyatavasa (period of exile), Arjuna sends his wife Subhadra and their son Abhimanyu to Dwaraka to stay with her brothers, Krishna (N.T.Rama Rao)and Balarama (Gummadi Venkateswara Rao). Sasirekha (Savitri), Balarama's daughter and Abhimanyu have been in love with each other from their childhood. Their families had agreed to get them married when they were children. However, Balarama's wife refuses to honour that commitment as the Pandavas no longer have their kingdoms and are in exile. Balarama decides to conduct Sasirekha's marriage with Lakshmana Kumara (Relangi Venkata Ramaiah) who is his favourite disciple, Duryodhana's (Mukkamala) son. Krishna advises Subhadra to approach (Ghatotkacha) (S.V.Ranga Rao). Initially Ghatotkacha assumes them to be intruders in his forest and attacks them, but later apologizes once he realizes who they are. He goes to Dwaraka along with his retinue. Using his magical powers he assumes the form of Sasirekha and goes about wrecking her marriage with Lakshmana Kumara. .
Unmatched performances and Sheer Technical Brilliance. maya bazar is always going to be the number one movie of telugu film industry.No one can dare to dispute this fact.It should be protected by all concerned and preserved for future generations.It is a marvel in every department of movie production.Every telugu person should study it to the minutest detail.